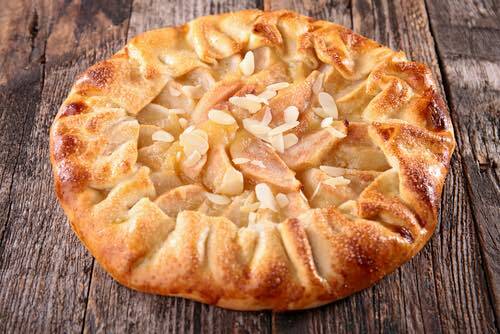 Enjoy trying these historical Renaissance tart recipes. Tarts and the much smaller sweet tarts, sometimes called chewettes, were usually made without an upper crust, as distinguished from a pie; and they often contained preserved fruits, almonds, citrus peel, and even minced meats. Make your Renaissance-style tarts rich and chewy and for a traditional appearance, elaborately decorate them with colored sugars. Take a Quart of Cream, and when it boils, put in half a pound of ſweet Almonds blanched and beaten with Roſewater, boil them together till it be thick, always ſtirring it for fear it burn, then when it is cold, put in a little raw Cream, the yolks of twelve Eggs, and ſome beaten Spice, ſome Candied Citron Pill and Eringo Roots ſliced, with as much fine Sugar as will ſweeten it, then fill your Tart and bake it, and ſtick it with Almonds blanched, and ſome Citron Pill, and ſtrew on ſome ſmall French Comfits of ſeveral colours, and garniſh your Diſh with Almonds blanched, and preſerved Barberries. Having ſome Puff-Paſt ready in a Diſh or Pan, lay in ſome preſerved Pippins which have Orange Pill in them, and the Juice of Orange or Limon, ſo cloſe them and bake them a little. This Renaissance tart recipe makes an interesting sweetmeat pastry consisting of several fruity layers separated by a flaky puff pastry. 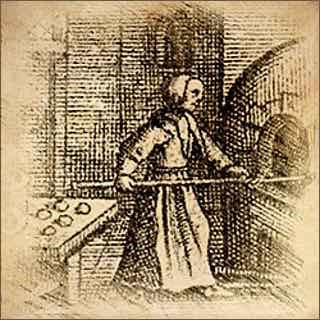 Take ſome Puff-paſte, and roule it very thin, and lay it in the bottom of your baking-pan, then lay in a Lay of preſerved Rasberries, then ſome more Paſte very thin to cover them, then ſome Currans preſerved, and then a Sheet of Paſte to cover them, then Cherries, and another Sheet to cover them, then any white Sweet-Meat, as Pippins, white Plumbs, or Grapes; ſo lid it with Puff-paſte, cut in ſome pretty Fancy to ſhew the Fruit, then bake it, and ſtick it full of Candied Pills, and ſerve it in cold. Enjoy experimenting with this early recipe for making puff pastry. Renaissance puff paste was similar to today's puff pastry, so if you're in a hurry substitute the store-bought kind. 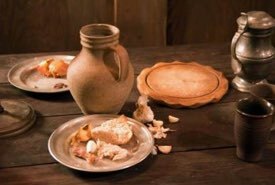 Take a quart of the fineſt Flower, the Whites of three Eggs, and the Yolks of two, and a little cold water, make it into a perfect Paſte, then roul it abroad thin, then lay on little bits of Butter, and fold it over again, then drive it abroad again, and lay on more Butter, and then fold it over, and ſo do ten times, make it up for your uſe, and put your Fruit or Meat therein and bake it. Tarts in the Renaissance Era were richer and chewier than today's. They were spiced, highly sweetened with sugar or honey, and sometimes thickened with almond milk while baking. Their pastry crusts were crimped around the edges and for festive occasions, and they were fancily decorated with colorful comfit candies and had flavored sugars strewn over them. Violet and rose flavored sugars were the favorites with their natural colors. 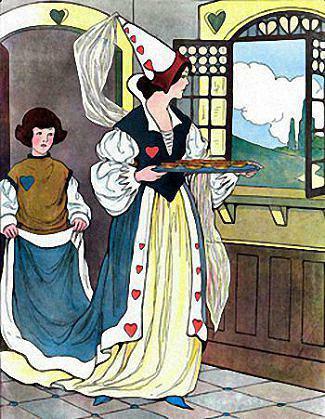 The Knave of Hearts brought back the tarts and vowed he'd steal no more. The old familiar nursery rhyme was first published England, in 1782, though it might have originated much earlier, when tarts were being made using these actual recipes. Author Lewis Carroll made reference to the rhyme's Queen of Hearts in his novel "Alice in Wonderland" in 1865, when he penned her as saying the oft-quoted line, "Off with their heads!" The Queen's Renaissance tart recipes are easy to make, and the colorful sweetmeats will be a hit with your guests, especially the youngsters who know the rhyme.